"I'm happy that you liked that and take it as a sign that the godlike Master is with us. May he remain with us the entire evening." 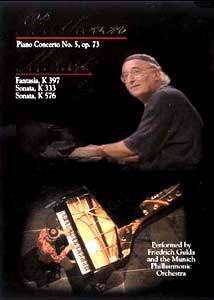 This disc captures portions of two concerts given by the idiosyncratic classical/jazz pianist Friedrich Gulda, playing two of the composers with whom he is most identified: Ludwig van Beethoven and Wolfgang Amadeus Mozart. From Beethoven we get one of the most imposing and intimidating works in the repertoire, while by contrast Mozart gives us several more intimate pieces. Gulda does a splendid job in interpretation on all counts. The Beethoven Concerto Nr. 5 op. 73 (commonly called the "Emperor" concerto, a name not given by the composer) is a watershed work in several ways. Most importantly, it is the first almost symphonic concerto, and its virtuoso requirements are well beyond that of any of its predecessors. Gulda plays while he also conducts the orchestra, much as Beethoven did back in his day when performing his concerti. This doesn't always work well, for he gets caught up in the moment more than once and has difficulty getting back to the keyboard for his entrances. The massive opening chords in the orchestra, with the pianistic decoration upon them, are truly spectacular here. The cadenza for the first movement (written out in full by Beethoven) is treated by contrast as a precious music box theme, amusingly set off against all the bombast. Gulda's playing is not flawless by any means; he on occasion laughs at a particularly bad note, but the spirit and verve of Beethoven is clearly present and allows one to overlook such minor details. The second movement Adagio is given a lovely contemplative and almost improvisational air; as the ghostly hints of the third movement theme are given at the end, one feels chills run down the spine. The concluding Rondo with its breathtaking leaps and amazing figuration is taken at a breakneck speed that leaves the audience gasping in disbelief. Gulda makes the near-impossible sound easy with his fluid motions, and the humorous good nature of the movement provokes a laugh from the audience as it winds up. The second part of the program, shot in 1995, dates from a period when Gulda played nothing but Mozart. His interest in jazz shows up in his interpretations of the composer, particularly in his figuration of repeated sections. First off is the popular Fantasia in D minor, K. 397. The tendency toward ornamentation helps further the improvisational feeling of this web of arpeggios. More substantial are two sonatas, the comparatively early K. 333 in B-flat and the final sonata, K. 576 in D from 1789. Gulda's playing on these sonatas is more precise (no doubt in part due to the fact he need not contend with conducting an orchestra). His expressions and gestures as he plays demonstrates that he is as one with these works. He has a strong and whiplike staccato touch that is put to good use, often in contrast to the legato playing of the other hand. The camera here takes far more interesting angles than it does on the Beethoven piece, including several intriguing shots from directly overhead the pianist. Gulda, ever the iconoclast, has no problem chatting with the audience in between movements, or making comments such as announcing a cadenza out loud. This disc makes it clear what a great loss Gulda's death in January 2000 was; he had a terrific talent for bringing out the feeling in widely diverse pieces in a wide variety of moods. At least some of his playing is preserved here for us. Image Transfer Review: The picture is quite soft throughout, leading me to suspect that these concerts were shot on videotape. Colors (such as the wildly-colored shirt Gulda wears for the Mozart pieces) are bright and vividly rendered. Blacks tend to be somewhat lacking, as is to be expected in filmed concert presentations. Video bit rates are somewhat on the low side, ranging around 4-5 Mbps but sometimes dipping as low as 2. Shadow detail is nearly nonexistent. Audio Transfer Review: Both a DD 5.1 and an uncompressed PCM track are included. The piano sounds rather brighter on the 5.1 track (almost painfully so after one has listened to the PCM track for a while). Comparing the two is difficult because the 5.1 is presented at a much higher volume level than the PCM version. However, both versions are quite acceptable on their own. We also pick up some of Gulda's Glenn- Gouldish humming along with his playing. There is occasional microphone noise, especially during the Mozart pieces, which is sometimes highly distracting. Hiss is practically nonexistent. The lowered grade is primarily due to the mike noises. Extras Review: Pioneer includes a wonderful extra on this disc: an extensive musical analysis of the pieces as one of the optional subtitle tracks. I've seen this on at least one other Pioneer Classics disc, but this one is quite superior. Not only does it discuss the structural components of the compositions, but additional information is included here as well as comments on Gulda's performance style. The comments are screen-specific, making this a very enjoyable counterpoint to the show itself. I highly endorse this more intensive analysis, which amounts to a full-length commentary. Also of note are lists of historical events that were occurring at the time of the composition of the respective pieces; which one can feel the drama of the Napoleonic Wars in the Beethoven concerto, one hardly senses that the K. 576 sonata with its childlike rondo was composed at the same time as the French Revolution was changing the face of Europe forever. Brief bios of Gulda and the Munich Philharmonic Orchestra are also included as are fairly thorough liner notes on the compositions themselves. While not a packed special edition, this is a definite leap forward in presentation of a classical music DVD. Keep it up, Pioneer!! A breathtaking reading of the Emperor Concerto, and more introspective versions of Mozart piano pieces, together with a valuable musical analysis special feature, makes this disc a must-have for classical music lovers.